I found this denim jacket in my closet a few days ago. Can you imagine that I used to wear it when I was around 5 or 6 years old?! It must have been quite big for me at that time, that's all I can say! 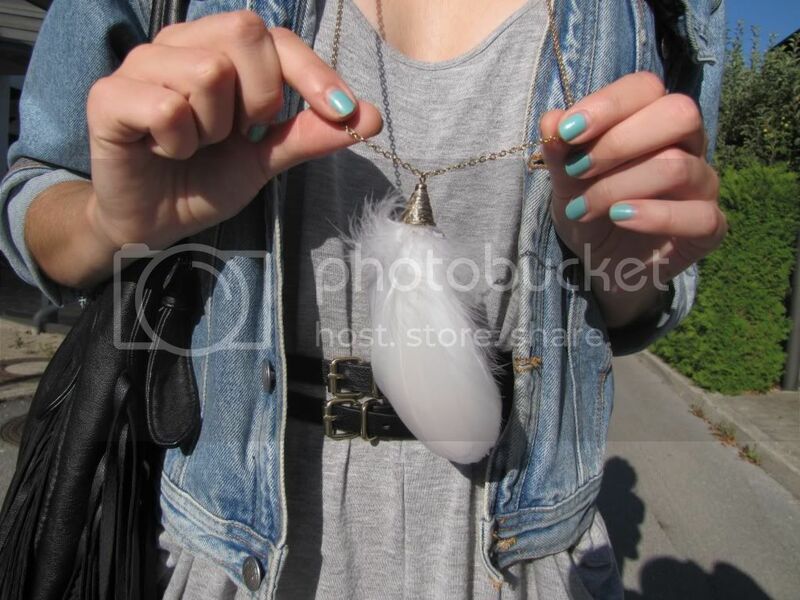 :D And the new feather necklace? It was a gift from my little sis, that just came home from London and I absolutely adore it! Wearing Topshop dress, vintage denim jacket, Topshop bag, vintage sunglasses, H&M belt. zelo všečno ;) kje pa si čevlje kupila? Love this casual look. The denim goes perfectly with the dress. I love your necklace too! you look so cute and fashionable! Love your outfit ! I would say that it's real simple but cool but actually I don't think it's simple at all it's really an outfit to "make a statement", love it ! i just love your bag so much- i need a bag like that too. and i need a nice denim jacket too. love love love your blog...did i said that i looove your blog...lol! p.s. amazing necklace...where did you bout it? Such a wonderful look! Gorgeous dress + jacket. Thanks for the lovely comment! <3 the denim jacket and your blog! So cute !! Love this outfit.